Australia - Brown years: 1923-1939. Ordinary rate delivery form: AB-DO-7B. Heading and notes: Form number T.G. 42B. RECEIVED TELEGRAM below one line C of A heading and COMMONWEALTH is either short of the advertising box or just reaching it. Reverse side: Advertisements - 3 in 1933, 1 from 1934 to 1939. Colours (text & form): Blue on cream. Size of form overall: 126 × 214 mm. 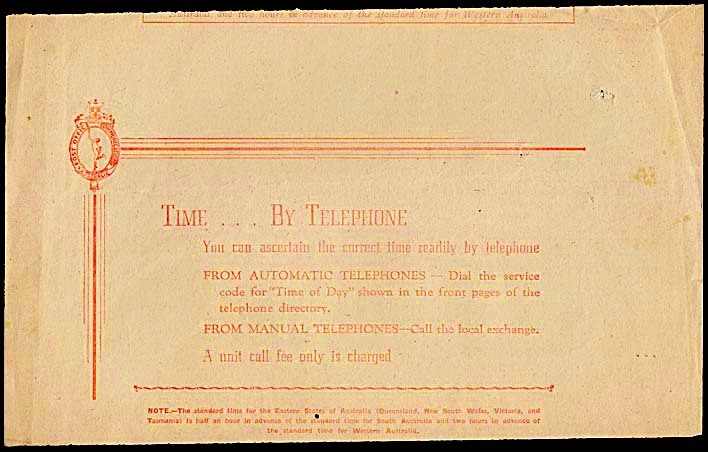 a change from three to one advertisements on the reverse side in the second 1933 printing (DO-7Bc). This change was accompanied by the introduction of the Hermes logo on the reverse side. There were a number of variations in its design. These type 7B forms were printed from April 1933 whereas the (non-teletype) type 7 format with the same design were printed from June 1929. 7Ba Single line Telegraph! ... in 4 full lines. 3 adverts. 7Bb Double line Telegraph! ... in 3 lines. 3 adverts. 7Bc Double line Telegraph! ... in 3 lines. Single ad. with Hermes in shaded blue circle. 7Bd Single line Telegraph! ... in 2 lines. Single ad. with Hermes in unshaded blue circle. 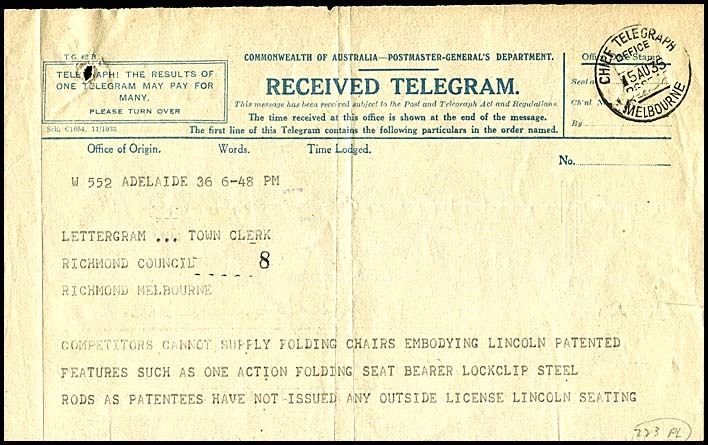 7Be Double line Money Order Telegram. Single ad. with Hermes in blue oval. 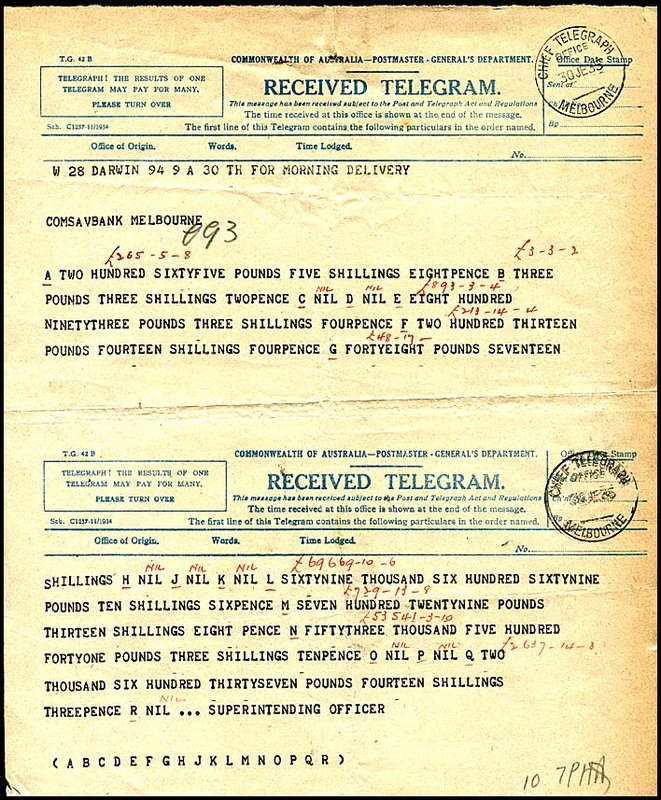 7Bf Double line Money Order Telegram. Single ad. with Hermes in orange oval. 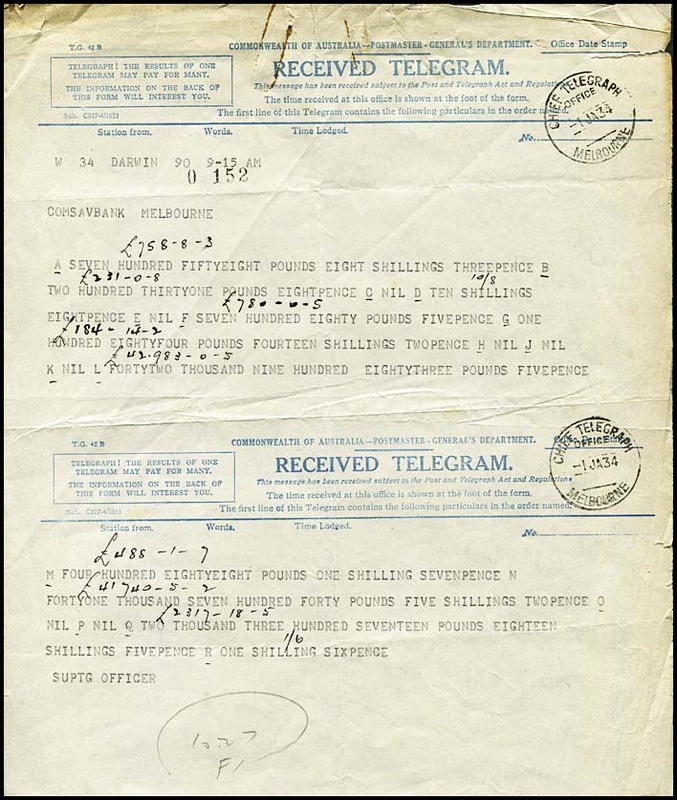 7Bg Single line Money Order Telegram. Single ad. with Hermes in orange oval. Printed in April 1933. AB-DO-7Ba. first entry under the line is STATION FROM. 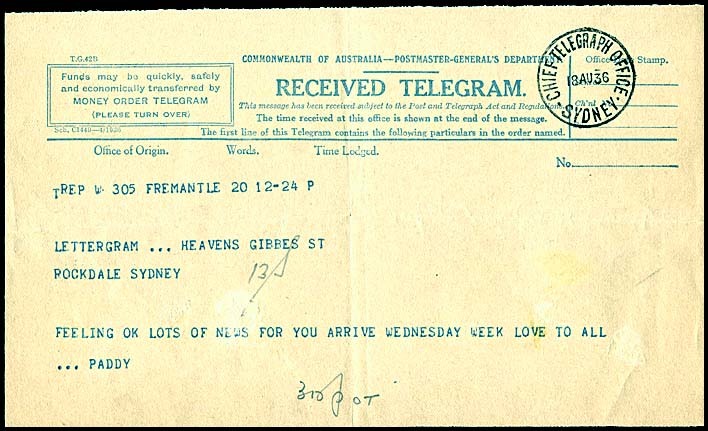 This particular telegram was written in the Commonwealth Bank code to send the weekly return of transactions to head office. Reverse side of the above form has three advertisements - all of which are separately boxed. Also has a note about the time divisions between States in Australia. Printed in November 1933. AB-DO-7Bb. 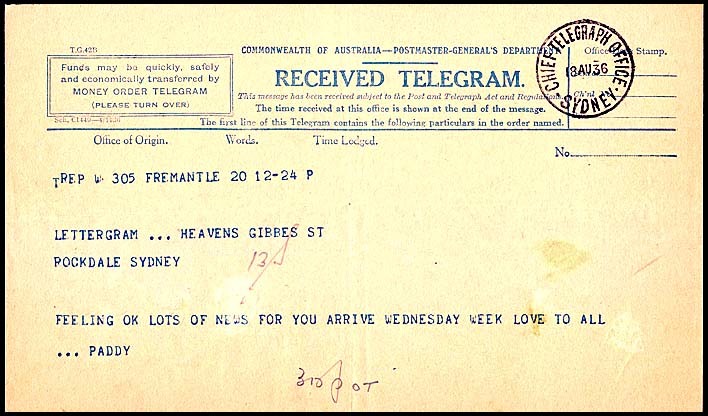 CTO Melbourne 19 November 1934.
first entry under the line has been changed to OFFICE OF ORIGIN. The reverse side of the above form has three advertisements - all of which are separately boxed. 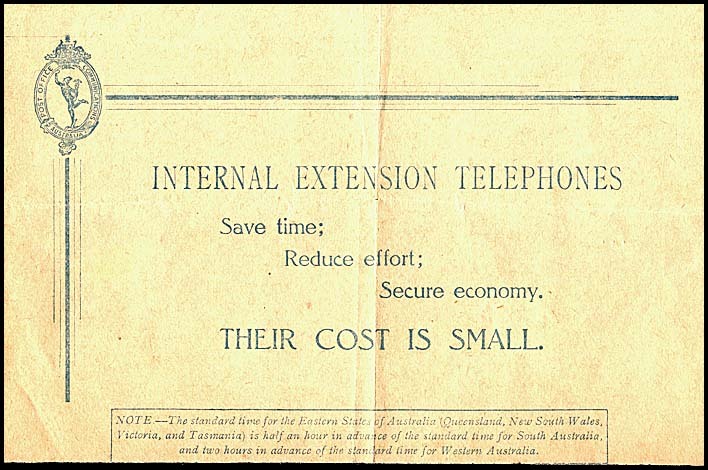 The first and third advertisements are the same as previously but the middle advertisement has changed to INTERNAL EXTENSION TELEPHONES. Printed in November 1933. AB-DO-7Bc. 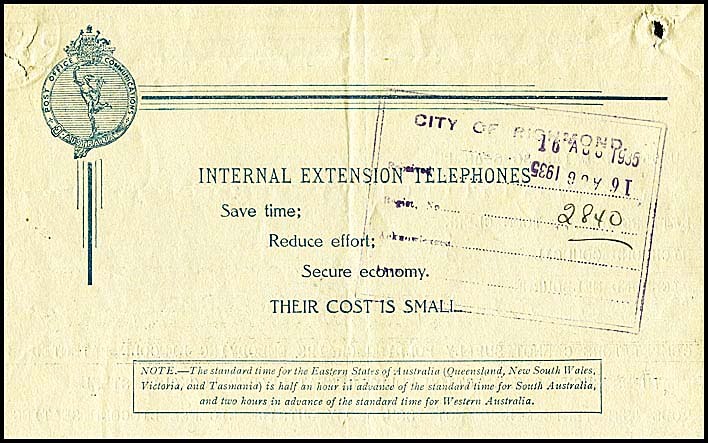 Chief Telegraph Office Melbourne date stamp of 5 August 1935.
reverse side has a single advertisement - see below. Reverse side of the above delivery form. 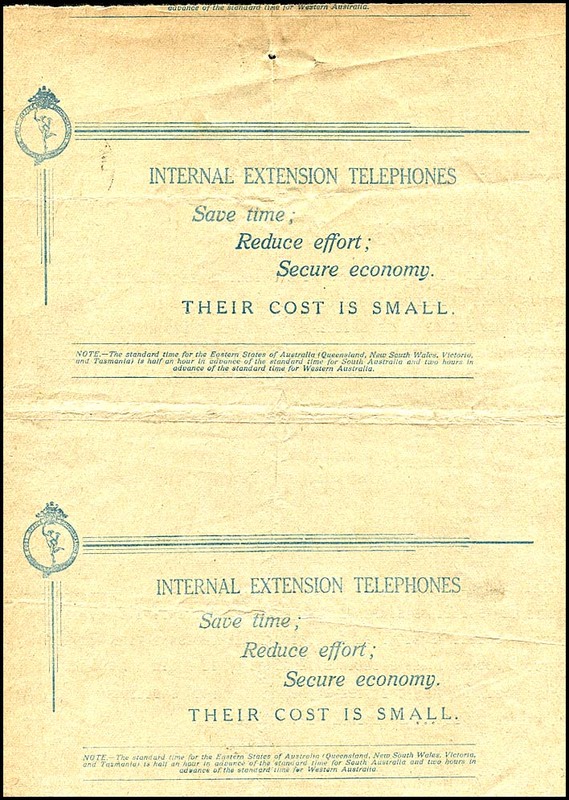 the format of the reverse side has been changed to a single advertisement - despite the form still showing it as being printed in November 1933. Printed in November 1934. AB-DO-7Bd. Chief Telegraph Office Melbourne datestamp of 30 June 1935. 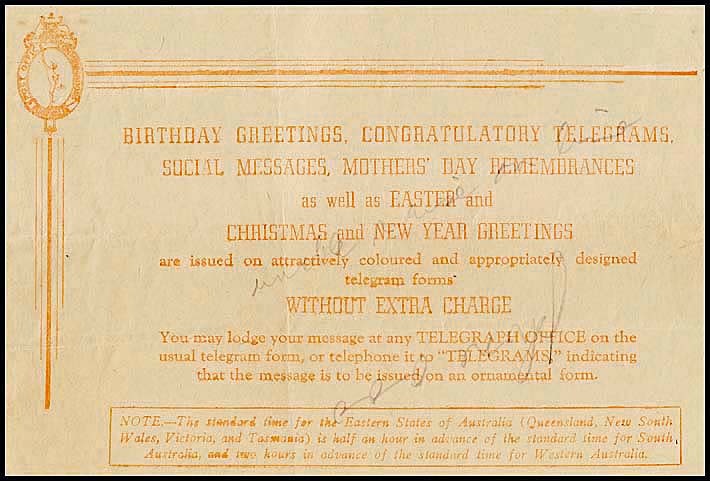 A double form with text in Commonwealth Bank code like that for AB-DO-7Ba (see Codes in Telegrams section). Reverse side of the above form with a large single advertisement in blue. Hermes, in blue, is surrounded by a smaller circular frame than previously (diameter: 18 mm) and the background is unshaded. Printed in April 1936. AB-DO-7Be. single advertisement on reverse (see below). The single advertisement in blue on the reverse side of the above delivery form. The base of the form was slightly trimmed when the form was torn from the teletype machine. The Hermes image, in blue, is surrounded by an oval frame and an unshaded background. The image is leaning forward. It is 16 mm wide (at the waist) and 29 mm high. Printed in November 1937. AB-DO-7Bf. Chief Telegraph Office Sydney date stamp of 18 August 1936. The reverse side of the above form. the Hermes image is 16 mm wide (at the waist) and 29 mm high. Printed in October 1939. AB-DO-7Bg. (no datestamp because received by military). reverse side has a large single advertisement in orange. This particular form had been aligned incorrectly in the teleprinter and shows part of the following form at the base. Has a scarce 1935-42 URGENT label (123 mm) wide in orange. Reverse side of the above form showing the one large advertisement in orange filling the back of the form. The Hermes image is 16.5 mm wide (at the waist) and 28 mm high. INSTALL THE MODERN HANDSET TELEPHONE! The TIME advertisement (# 1 in the above list) is shown. In the box below, which indicates time zones in Australia, the lowest line has five words finishing with Western Australia. The last line of the advertisement from the previous form is shown at the top. 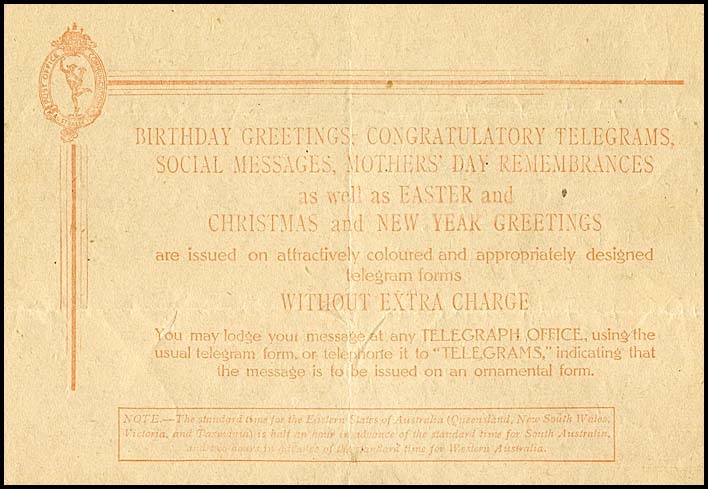 Clearly the format at the top is very different from that for TIME ... - but it is identical with that for Birthday Greetings shown above. Hence it appears that on the one teleprinter roll, different advertisements were printed. Details of use and rarity. DO-7Be Sch. C1449 - 4/1936 1 July 1936 at CTO Melbourne. DO-7Bf Sch. C1958 - 11/1937 2 September 1938 at CTO Brisbane. DO-7Bg Sch. 2233-11/1938. 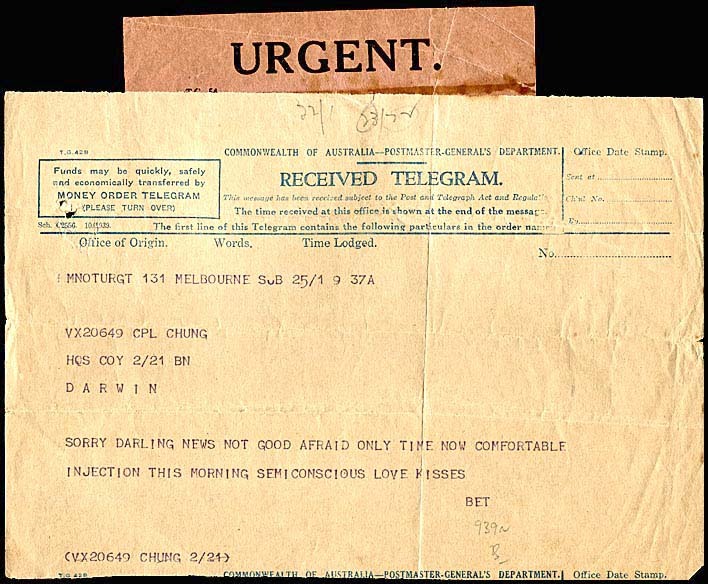 2 August 1940 at Darwin, N.T. Sch. C2556. 10/1939. 13 May 1941 at CTO Melbourne. Previous ordinary rate delivery form (AB-DO-6). Type A ordinary rate delivery form (AB-DO-7A). Next ordinary rate delivery form (AB-DO-8). 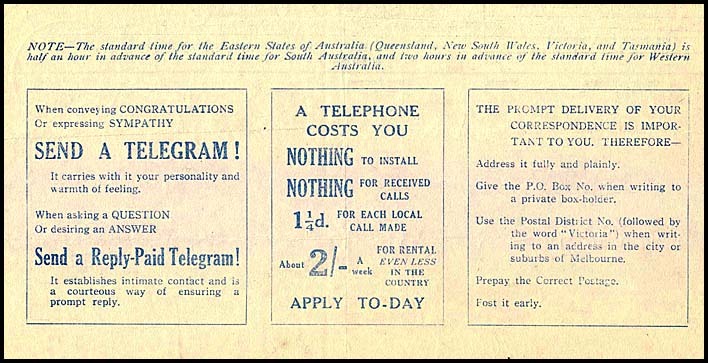 Advertising on Australian telegrams & envelopes. Overview page for the Australian ordinary rate delivery forms.